Your incredible experiences on shore are matched only by the service you’ll receive onboard. We hold ourselves to a high standard, and you’ll feel it from the warm welcome on departure day all the way through to the final wave when you disembark. Friendly and helpful, our crew are always ready to lend a helping hand without feeling under foot. Get ready for a premiere cruise experience. See the world from a fresh perspective and enjoy boutique hotel-caliber service and amenities during your time at sea. 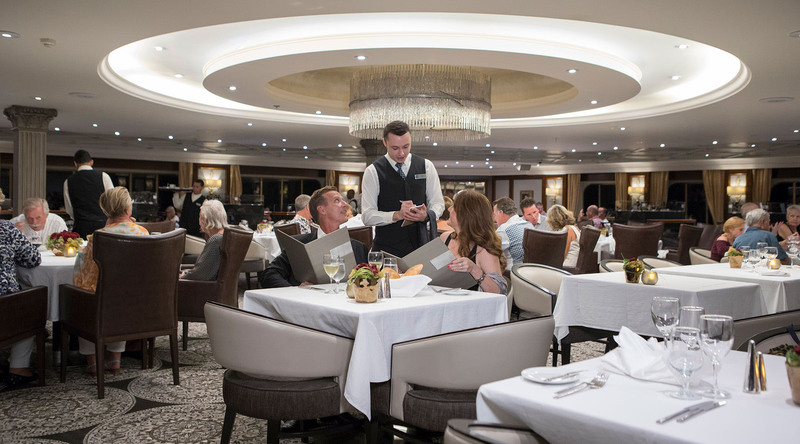 At Azamara Club Cruises® we’ve reimagined the onboard experience from bow to stern. Size, style and service all combine to deliver a true boutique hotel atmosphere during your voyage. Our intimate ships create a club-like setting, and can go places larger vessels can only dream of, like the heart of Venice or Crete, or up majestic rivers like the Mississippi or the Elbe. The friends you make on board will never feel too far away, and our exceptional services and amenities are all within easy reach. Friendly and personalized service is the hallmark of every Azamara voyage. From captain to stateroom crew, each member of our staff holds themselves to the highest service standards to ensure your cruise experience is relaxing and stress-free. Nothing is ever too much trouble for our crew. You’ll always be greeted and welcomed back after a day of on shore exploration with a warm smile. We’re just as excited to sail the world as you are! Every inch of our ships have been revitalized to deliver modern elegance and bring inspiration from the world onboard. Step into your soothing sanctuary at sea with our redesigned staterooms and suites, or take your accommodation experience to the next level with our brand new ocean-inspired spa suites. Soak in a sunset at the new outdoor Pool Grill and Bar, and follow it up with a dazzling night of music, dance, and more in our improved entertainment spaces. Our small ships have some big advantages. Cozy, not cramped, comfortable and never crowded, savor a club-like setting and enjoy easy access to ports larger vessels just can’t fit. Plus, our onboard service and amenities create an unrivalled cruise experience. From fitness to relaxation to good old-fashioned fun, see what’s in store when you step onboard. From drinks and dining to laundry and land transfers, almost everything you can think of is already included in your cruise fare. An immersive AzaMazing Evenings® event is yours to enjoy on most voyages, and our concierge team is always on hand to help customize your cruise experience. The only finger you’ll have to lift will be to make a menu selection! While onboard, our destination-focused programming will help inform and educate you about the ports you’ll visit. Our specially curated lecturers have found the very best highlights of each destination and are eager to share their experiences with you. Plus, our World Wildlife Fund® speakers will be onboard to show how you can connect with the natural world during you time on shore, and how Azamara is helping to protect the waters we sail. This immersive programming extends to our menus as well! We source local ingredients whenever possible and feature them in delicious destination-inspired dishes at Discoveries Restaurant.